Firstly, let me wish you a Happy and Healthy New Year - I hope that you feel rested after the winter break. 2014 is going to be a very important but confusing one for those of us concerned with children with SEN and the law. 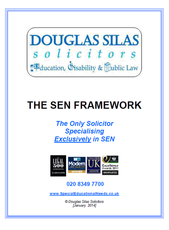 Not only will we have the normal ‘Statementing’ issues to think about, as well as Secondary Transfer and other Tribunal appeals to contend with until July 2014 or so (see our FAQs About Secondary Transfer) but, crucially, there is also the imminent move to a new SEN framework in September 2014 for us all to think about and prepare for. So I think that this is going to prove a very interesting year for all of us. I know how busy everyone is so, as I always say, please feel free to read just the sections that are of interest to you or read everything. The choice is always yours. I can’t believe that it was nearly a year ago (February 2013) that the (present) Government first issued the Children & Families Bill. This is the basis of the imminent changes to the SEN Framework (please note that the Bill is still going through Parliament and being amended but is due to receive Royal Assent and become an Act in the next few months - i.e. it will become law but not actually come into force until September 2014). However, it was as far back as March 2011 that the (present) Government issued their SEN Green Paper (you can still read what I wrote about it in my May 2011 update as my concerns then still seem relevant now). In fact, the whole process of change started even earlier than that; first there were five (yes 5!) formal Inquiries dating back to 2006 (under the previous Government), the most famous of which was ‘The Lamb Inquiry’ in 2009 (you can also read my summary of it in my January 2010 update which also still seems relevant today). In reality, the changes we are now facing started getting underway with the (present) Government’s initial ‘Call For Views’ on SEN in September 2010. This led to the SEN Green Paper which subsequently led to the Children & Families Bill that now will soon become the Children & Families Act. I wonder to myself sometimes, if someone like me, whose professional role it is to keep abreast of things in the SEN world everyday, gets confused from time to time, how can a parent of a child with SEN keep up with all the changes! Draft Transitional Arrangements for Transition to Education, Health & Care Plans! Whilst some of these documents are only a few pages long (apart from the Draft SEN Code of Practice which currently runs to 174 pages) I know that they all add up to a lot of reading. I have therefore (with thanks to my colleague, Amy Evanson, who has done an Internship with us during these past few months) prepared a summary of what you may need to know about the Draft SEN Code of Practice. You can read it here. (If you want to read any of the original documents in full for yourself you can still do so by clicking on the relevant links above). If things do go to plan (and I am afraid that this Government seems intent on implementing the new SEN Framework in September 2014 even if we may not be ready for it) we all need to start preparing ourselves for the big changes that are going to happen to the SEN framework. It is therefore very important that you read this and my next few updates and also pass them on to others that may not already know about them who they may be relevant to. 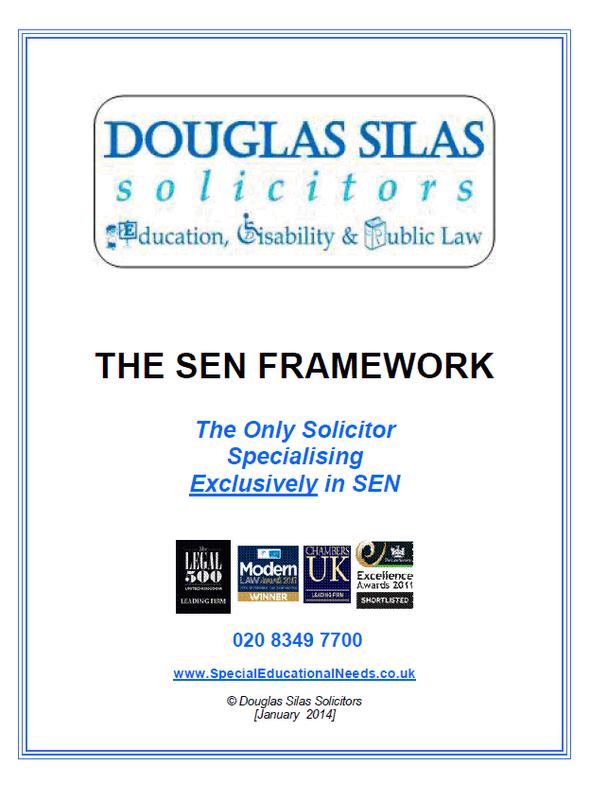 To make it a bit easier for people to understand the changes, I have written a 10-page free guide entitled ‘The SEN Framework’ which people will be sent automatically now when they also subscribe to receive my updates by email. You can do this now by filling in your name and email address here or in the box at the bottom of every page. (if you are already subscribed to my updates but still want the guide then please sign up again now above as this is a new email list). If you already read my updates, you will know that I use them and our website to try to help as many people as possible by empowering them with information. It has always made me pleased over the years to know that we have helped so many parents of children with SEN (and therefore their children ultimately directly/indirectly) especially when I receive grateful or complimentary emails/ messages from individuals, some of whom I know and some of whom I don’t. But the complaints that I do get from time to time is where people tell me that they did not know that there was someone like me out there that could have helped them get through the SEN maze, that they wished they had known about our website before as it could have helped them or that I should try and make it even easier for people to get the information I provide. Although I have been doing SEN cases for almost two decades now, I only set up my own firm in 2005. At that time, the way I wanted to do things was still quite innovative and it was almost unheard of that a solicitor would give away so much information for free on his website and also be so up-front about his fees/services. Over the years though, I have noticed how many people (including solicitors) seem to have copied me (someone has to remind me once in a while that I should take this as flattery!) It seems now as though everybody is trying to ‘help’ you! So, putting all these things together and seeing how the world has changed during these past few years with the increasing use of Social Media, I have decided to again redesign this website so that I continue to help as many people as possible and make it easier for them to share relevant information about SEN.
As such, this section of my website has been renamed 'SEN News Online' and I am now using Social Media platforms like Twitter, Facebook, LinkedIn and Google+ to share information. I have put the relevant buttons on each and every page to make it easier for people to ‘share’ things with other people. I have also put relevant buttons in some places to make it easier for people to ‘follow’ or ‘connect’ to me. I am also going to start providing more regular information to those who want it more than these three times a year/Termly updates, by now sending ‘tweets’ (on Twitter) or 'posts' (on Google+) where I will provide useful SEN information and as and when SEN news arises. 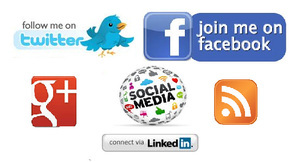 As we all have busy lives these days, it is often easier to just ‘retweet’, ‘post’ or ‘share’ something with others, rather than forwarding emails or manually 'posting' hyperlinks. Don’t worry, I am not provide irrelevant information about what I had for breakfast or ask you to watch a funny video I have found of a cat playing the piano! Finally, as I know that some people like to sometimes read in more detail what I or others say about an issue, I have also setup a third section called 'Articles' where I will occasionally share articles that I or others have written. I have already kicked it off with an article I had published in 'Education, Public Law and the Individual' a few months ago, coincidentally, on the Children & Families Bill. I hope that doing all of this helps makes everyone's lives easier and allows them to share things more easily or stay up to date with SEN news more regularly. Even if you already receive these updates by email directly, if you now also use Social Media platforms like Twitter, Facebook, LinkedIn or Google+, make your life easier immediately by ‘following’ or ‘connecting to me now using the relevant Social Media buttons on this page. And, of course, if you are receiving this update indirectly or have been referred to our website by somebody else (or have even just stumbled on us by chance), make sure that you definitely either sign up now to receive my updates directly by email (using the box at the bottom of every page) or also use the relevant Social Media buttons on this page. Go on, do it now before you forget! I always like to write a few paragraphs every update about a few events that I have attended since my last update (in September 2013) or which are coming up before my next update (which will probably be around April/May 2014). Since my last update, the only event of note that I went to was the 21st Anniversary of the Special Educational Consortium (SEC). It was good to hear of the 21 achievements and the good work that the SEC has done these past 21 years collectively speaking and campaigning on behalf of other Education and Disability organisations. I sincerely wish them strength for their next 21 years. 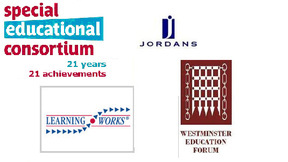 In terms of forthcoming SEN events that may be of interest to people, there is the Jordans’ Annual SEN Law & Practice Conference 2014 on 5 March 2014 in London, the Westminster Education Forum on ‘Special Educational Needs & Disabilities – Implementing the Children & Families Bill’ on 8 May 2014 also in London and the Learning Works 17th Annual SEN Residential Conference 2014 on 16/17 May 2014 in Swindon. I have been kindly asked to speak at the first two events (Jordans/Westminster Education Forum) together with a number of notable speakers; so if any of these events are of interest to you, please visit the relevant websites and book yourself a place. As many people know, although I am physically disabled and use a wheelchair to get around, I always seem to have lots of nice things happen to me. At the end of my last update I said that I hoped to be able to report back some personal good news in my next update. I am now delighted to say that, at the end of September 2013, I was the first recipient of an ‘Outstanding Achievement’ Award at the Modern Law Awards, in recognition of the way that I have used my website to help people. Although I was unable to attend the actual ceremony myself for personal reasons, I was presented with a beautiful glass obelisk earlier on the day prior to the award ceremony that was held at the Dorchester hotel in London’s Park Lane later that night. Actually, the main reason that I could not attend was because I was soon flying out to undertake the first of two international charity bike rides which I did almost back to back from the end of September to mid-October. First, I rode 380 km across the northern half of Israel; I then came back home for a few days before flying off to ride 450 km across Madagascar! I again raised a significant amount of money for Norwood, a charity for children with disabilities. I also got to spend a bit of time with some Malagasy schoolchildren as you can see from the photo above – the poverty there really makes you appreciate what we have got and often take for granted. The best bit of all for me is then, after I had returned home, I was invited to attend the opening of the ‘Sensory Garden’ that had been built by Norwood in one of their respite facilities (known as ‘Buckets & Spades’) using the money (over £40,000) that I had raised for them in October 2011 when I rode across southern Israel. It has always been very fulfilling for me to know that professionally I have helped so many children with SEN/Disability (and their families). But now also seeing tangibly that I am helping them personally is something very special for me as I know that it will also help many more children/families in the years to come. It has begun to feel that my professional and personal lives are beginning to merge! Like I said, ‘its fun being me! P.S. I always find it helpful to find out what people think about these updates, so please take a few seconds to tell me what you think by going to ‘January 2014 update – your thoughts’ – there are just 3 quick questions.